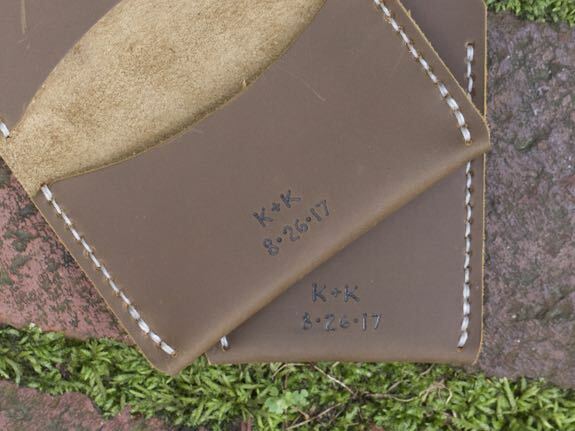 Add a monogram to make your handcrafted wallet even more personal. Initials, dates, and nicknames are most common, but I'm happy to draw symbols or even simple sketches if they aren't too intricate. I brand the wallets by hand, so the "font" is my handwriting—approximately 1/4" tall. I've found that keeping the letters relatively small looks cleanest. 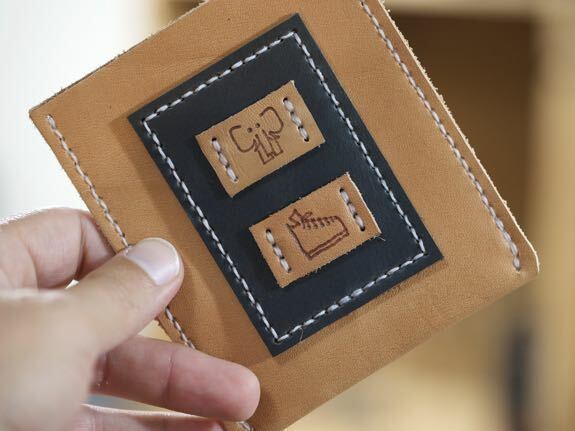 The monogram goes on the bottom right corner on the inside of the wallet for wallets that fold, and on the bottom right corner on the back of the wallet for wallets that do not fold. Since the brand is actually burned into the leather, the lighter the color of the leather, the more visible the brand will be. A monogram will still show up on the Angus Black and Limousin Brown leather, but it is very discreet. If you are looking for monogrammed products to be given as wedding gifts, be sure to check out the groomsmen and bridesmaids packages page. *Please Note: There will be no returns on items that have been personalized.